Yves Klein realising an Anthropométrie in his studio, 14, rue Campagne-Première, Paris, 1960 © Yves Klein, ADAGP, Paris / DACS, London, 2016. Photograph by Harry Shunk and Janos Kender © J.Paul Getty Trust. The Getty Research Institute, Los Angeles. Aesthetically the works of Alberto Giacometti and Yves Klein are strikingly different. Swiss-born Giacometti carved out his career as a sculptor and portraitist, while Klein was renowned for his colour theory and as a pioneer in performance art. Both artists, however, were profoundly influenced by their experiences during the Second World War. This engagement with the aftermath of destruction sits at the centre of Gagosian Gallery’s new exhibition In Search of the Absolute, which will display the artists’ works side by side for the first time. 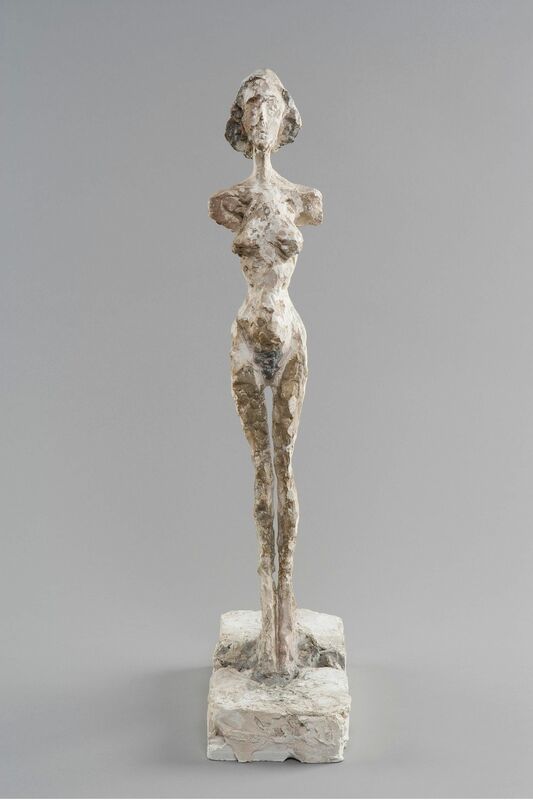 Giacometti stripped back his elongated bronze and plaster figures until they were almost skeletal in their dimensions. They were materially insubstantial but saturated with significance, becoming symbols of the trauma and anxiety that gripped society in the wake of war. The title of the exhibition, In Search of the Absolute, is derived from an essay by Jean-Paul Sartre, who wrote that Giacometti's sculptures were “always mediating between nothingness and being”. This exploration into the dialogue between tangibility and theory was an area that was of particular interest to colour theorist Klein. The exhibition produces an interesting dialogue between abstraction and the concrete. 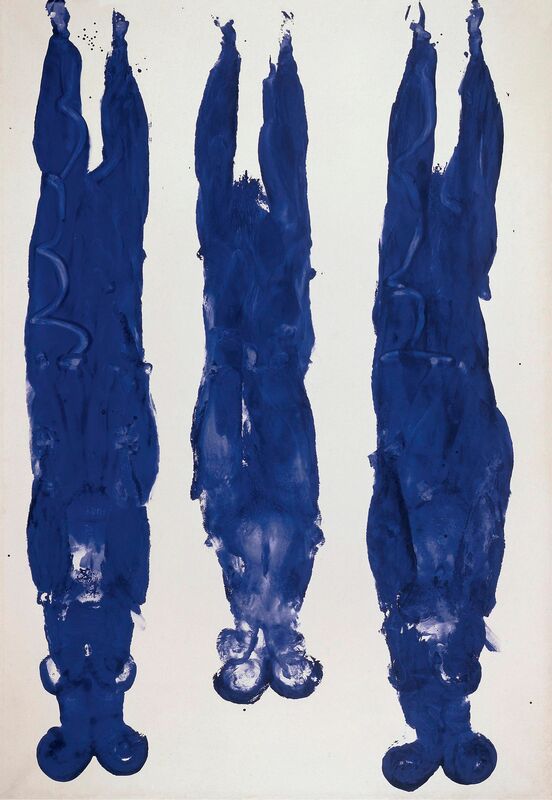 Peinture de feu sans titre (F 80) (1961), a piece from Klein’s Fire Paintings series, might at first glance appear nonrepresentational. In fact, it was created by wrapping one of his female assistants in fire resistant material and burning cardboard over the top to capture an imprint of the body underneath, offering a point of connection to Giacometti’s interest in the human trace. 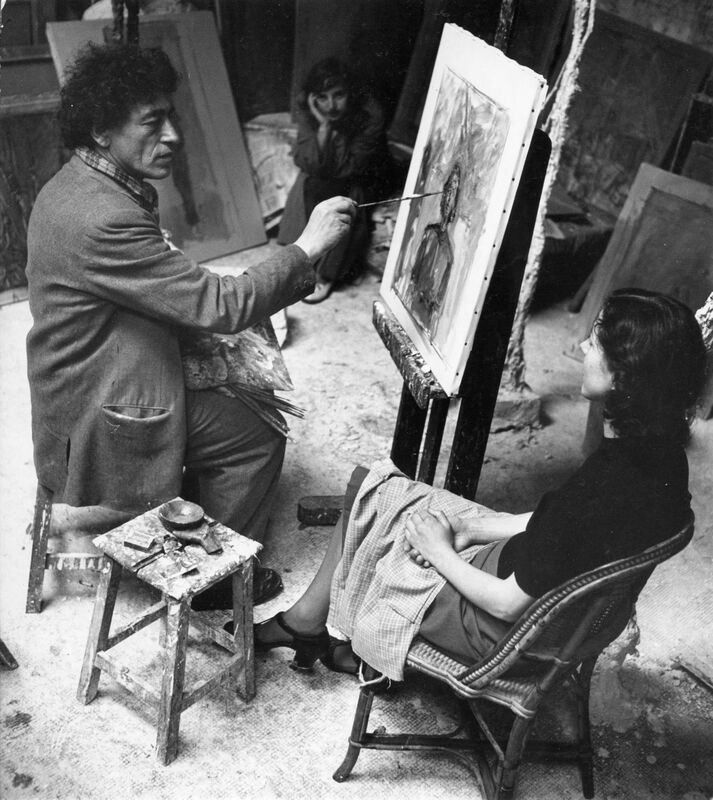 Although they lived in Paris's bohemian Montparnasse at around the same time, there is no suggestion that Giacometti and Klein ever met or influenced each other. Born in 1901, Giacometti came from a generation before Klein. He was very influenced by surrealist forms and theories, while Klein became a leading member of the Nouveau Réalisme movement, which went on to inspire American pop art. In Search of the Absolute places Giacometti’s agitated figures amongst Klein’s tranquil canvases to highlight – but not force – the links between these two artists, so that the viewer can appreciate each for their individual artistic visions.